The 13C-CPMAS-NMR spectra of compost used for field treatments in the three experimental sites are shown in Fig. 4.1, whereas the relative distribution of signal areas is reported in Table 4.9. Since compost samples had a common origin, a similar C distribution was found in NMR spectra. 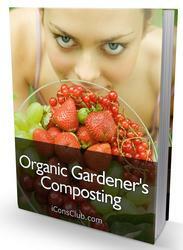 The spectra of mature composts were dominated by the alkyl-C (0-45 ppm) and O-alkyl-C (60-110 ppm) signals. The alkyl-C region comprised a prominent peak at around 30 ppm, mostly due to methylene carbon chains (CH2)n and terminal methyl groups in plant lipid compounds, such as waxes and aliphatic biopolyesters. The O-alkyl-C resonances are assigned to monomeric units in oligo and polysaccharidic chains of plant woody tissues (Vane et al. 2001; Wikberg and Maunu 2004). 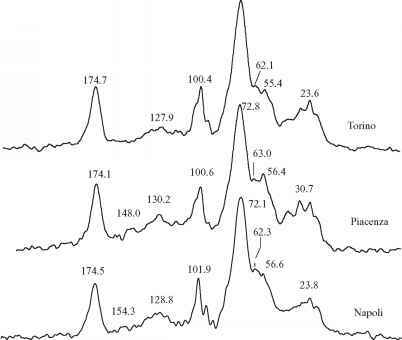 The intense signal around 72 ppm corresponds to the overlapping resonances of C2, C3, and C5 carbons in the pyranoside structure of cellulose and hemicellulose, whereas the signals at 105 ppm (sharp), 64 ppm, and 82-88 ppm (shoulders) are assigned to the anomeric C1, and C6 and C4 carbons, respectively, the latter being split in the presence of both amorphous and crystalline forms of cellulose (Atalla and VanderHart 1999). Plant woody tissues were also indicated by the 56 ppm shoulder of methoxy groups on the aromatic rings of guaiacyl and siringyl units in lignin structures (Liitia et al. 2002; Zhou et al. 2010). The aromatic region (110-160 ppm) also revealed distinct resonances for O-substituted aromatic carbons in the 147-152 ppm interval, the 128 ppm broad signal for C-substituted or C-unsubstituted aromatic rings of lignin monomers (Albrecht et al. 2008), or cinnamic and ferulic units in suberin biopolymer (Stark et al. 2000; Graca and Santos 2007). Finally the sharp signal at 172 ppm is currently assigned to quaternary carbons of carboxyl groups. 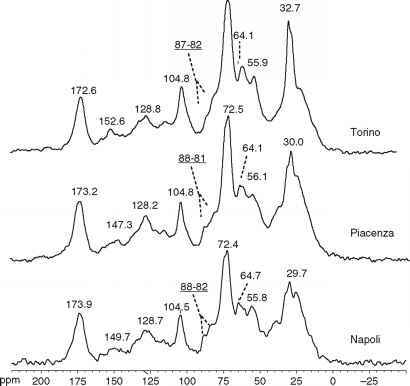 The OC composition shown by NMR spectra of compost closely resembles the molecular characteristics found for stable humified organic material in SOM (Spaccini and Piccolo 2007; Caricasole et al. 2011) with a large HB index (Table 4.9) due to a great content of hydrophobic molecules (Spaccini et al. 2008; Canellas et al. 2010). Conversely, CPMAS-NMR spectra of HS extracted from initial control soils showed a predominance of hydrophilic carbon components and consequent low HB values (Fig. 4.2 and Table 4.10). These extracts revealed that 58-61% of total C was due to carbohydrates (110-60 ppm) and oxidized carboxylic groups (190-160 ppm), whereas less than 15-17% of carbon was in aromatic (160-110 ppm) and alkyl (45-0) structures (Table 4.10). respectively). For compost samples, the Lignin Ratio varied from 2.5 to 3.3, while that for HS from control soils ranged between 5 and 6.3. These values thus indicate a likely content of lignified materials in compost samples (Vane et al. 2003), whereas this appears less probable for HS from control soil. In the latter, the intense signal at 56 ppm should be better attributed to C nuclei in alpha position of amino-acid moieties (Quideau et al. 2001; Hayes et al. 2008) rather than to methoxyl C in Lignin. In fact, NMR spectra of HS from control soils indicate that long-term cultivation without OM inputs reduced the amount of hydrophobic carbon, with consequent prevalent incorporation of biolabile components such as plant carbohydrates and peptidic derivatives. A small hydrophobicity of humic matter is a common feature in highly exploited and weathered soils (Piccolo et al. 2005b; Spaccini et al. 2006). The simultaneous increase of hydrophilic components with a decrease of alkyl-C in NMR spectra of SOM has been attributed to the presence of highly decomposable materials (Baldock et al. 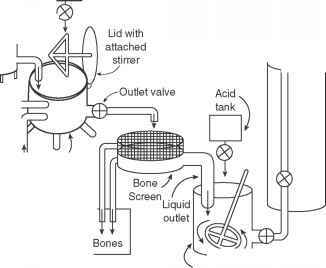 1997; Webster et al. 2001) with short residence time, fast turnover, and slow accumulation rate.